Happy Friday! This has been a really long week. Will has been out of town for work all week and I have had a long stressful work week. With that being said, this is a quick post to link up my Master Bedroom to the Roomspiration series over at Just a Touch of Gray. The biggest want in our bedroom was to keep it calm with color. I am really ready to get a new bedspread and change things up a bit. That’s it folks, I’ve run out of steam for the week so keeping it short! If you are wondering, the bedroom Furniture is part of the Martha Stewart Furniture Collection and I love it! I love the calming colors you have going on in here. I also love a good punch of color if you do decide to get new bedding. I don't think you could go wrong either way. Your mirrors are so cute hanging on the wall with ribbon! 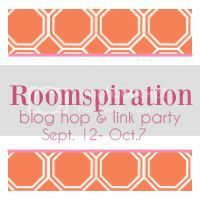 I'm glad you linked up to Roomspiration today! Your bedroom looks very calm and serene. Maybe you better lie down in it girl to get rid of all that stress. lol! Hope this week is better for you!